I've been nominated for the Next Great Filmmaker Award for Prayers for Peace in an online film festival with four other films. The grand prize is $5000. So basically, I have a 20% chance at $5000. It's hosted by Berkshire Film Festival and sponsored by Berkshire Bank, and just for voting you are entered into a drawing to win an iPad2, $1000 cash, or a BluRay player. It sounds pretty insane but I read the contract and they are perfectly legitimate, they just love film and want to support filmmakers. It's only one vote per person, so when you get the chance, follow the link and vote for Prayers for Peace. If I win I'm planning on using the money to help get my current project, the Animation Hotline, off the ground. Thanks for your support. And send this to other people who know me and you might think would want to vote. I've voted for Dustin for the award, and I hope you'll follow my example. From Mark Sonntag: In regards to Dustin Grella, if he's interested, he should list his project on Indie Go Go, it's a crowd funding scheme I'm looking at for my own project. I'd vote for but I'm not American, site doesn't support my address. MB replies: As I should have mentioned in my original post, the deadline for voting in this contest is May 31. I'll be away for the next week or so, so I won't be posting—not that I've been posting a great deal lately, anyway. I've been devoting most of my attention to my next book, on comic books. I've been thinking about this site, though, and, in particular, reviewing my list of interviews to get some idea of which ones might be most easily transferred to a page here. Happily, I've found quite a few. All of my early interviews exist as typescripts that must be scanned to be publishable, usually with extensive corrections, even though not nearly as many as once was the case. I transcribed the later interviews on a PC, starting around 1988, but in an obsolete word-processing program whose output also demands considerable tweaking. The editing required with transcripts of both kinds is not difficult, just boring, but I'm finding ways to cut down on the time with each new transcript. So look for a steady flow of interviews here, with John Freeman, Milt Kahl's assistant in the 1940s, probably next, as a natural followup to the Kahl interview I posted a few weeks ago. Otherwise, I'm planning to write a piece about Bill Blackbeard, the famed comics collector who died in March. I first met Bill more than forty years ago, when I stayed at his home on my first visit to San Francisco, and my perspective on his life and work differs somewhat from that of many other people, to judge from the tributes I've read. I also have in my queue some historical pieces that I expect will be a lot of fun to write. I doubt that I'll be writing many reviews, of new animated features especially. I'm not seeing many of those, and the ones I've seen haven't stirred me to hasten to the keyboard. I finally got around to watching The Secret of Kells on Blu-ray the other day, and I was disappointed to find that it is, contrary to what I'd been led to expect, a shallow children's film. As best I can tell, from the occasional feature I see and the others whose commercials tell me more than enough, we're passing through a period when art direction is all, whether expressed in Kells' fancy graphics or the hyper-realistic dust and grime of Rango. In the CGI features, the star voices (and the endless dialogue) carry the entire weight of characterization in stories of the most formulaic kind. And it all works, for critics and audiences and many fans. Just not for me. Back in 2006, when my biography The Animated Man: A Life of Walt Disney was about six months away from publication, I filled one of the last gaps in my research by visiting the Hermosa neighborhood in Chicago. Walt Disney was born and spent his first four and a half years there, until his father Elias moved the family to Marceline, Missouri. I'd saved Chicago for last because it seemed obvious that the places where Walt lived later—Marceline, Kansas City, Los Angeles—were much more significant in his life. Hermosa was by 2006 heavily Hispanic, and the church itself home to a Hispanic Baptist congregation, but it still looked very much as it must have looked a hundred years earlier. 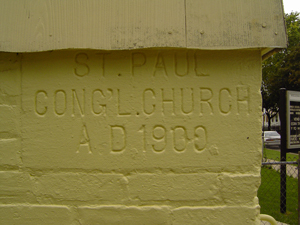 I posted some photos and a brief report on my visit, at this link; one of those photos, of the church's cornerstone, is below right. I was pleasantly surprised last month, when I was rooting around in the Chicago Tribune's online archive for articles about Walt's 1957 visit to the Chicago suburb of Evanston, to find a couple of 1900 articles about the groundbreaking for Saint Paul. One from May 19 announced the groundbreaking, the other from May 20 reported on it with three drawings, two of which I've reproduced here. One shows the church's pastor, Walter R. Parr—for whom Walter Elias Disney was named—turning a shovel full of earth at the ceremony, which began at 6 p.m.; the other shows Parr behind a plow being pulled by members of the congregation, including Elias Disney. Elias is mentioned in both articles, which is how I found them. Elias, a contractor, was one of the five members of the church's building committee; according to the Tribune's reporter, he didn't care for being hitched to the plow. You can read both articles by clicking on these links, for the May 19, 1900, article and the May 20, 1900, article. I especially like the opening of the May 20 article, with its references to the "green prairie" and the "virgin soil" of what was then a neighborhood on the western fringe of Chicago. You would be hard pressed to find any remnants of the prairie in today's Hermosa. Hollywood Cartoons: American Animation in Its Golden Age is now available from amazon.com as a Kindle book. The price is $14.82, quite a bit less than the paperback. The Animated Man: A Life of Walt Disney is also available as a Kindle book, for $9.99. From Giggle Comics No.19, May 1945. My 1990 interview with Karp, a Disney animator (Fantasia, Pinocchio) and later a mainstay of the "funny animal" comic books, is at this link. From Børge Ring: Lynn Karp animated some very good scenes in The Pointer of a frozen Pluto being bothered by a gang of innocent birds. Karp in his 80s seemed sort of frozen too but with initiative you harvested some very good information. Lynn Karp confirmed the image of Ham Luske as a friendly person. During a conversation about the Disney years from 1928 to 1936 Ollie Johnston once said, "You guys underestimate the importance of Ham Luske" (we had put questions about everyone else). Dave Hand told me that Ham Luske was the very first assistant he had when he started animating at Disney. These interviews are some of the most satisfying reading I know of. In your conversation with Milt Kahl it felt good to sense a dedicated, honest—perhaps ultimately humble—artist underneath all the acid firespewing, A wise friend said: "Arrogance is alright as long as it comes from within." From Steven Hartley: Nice interview, Michael! 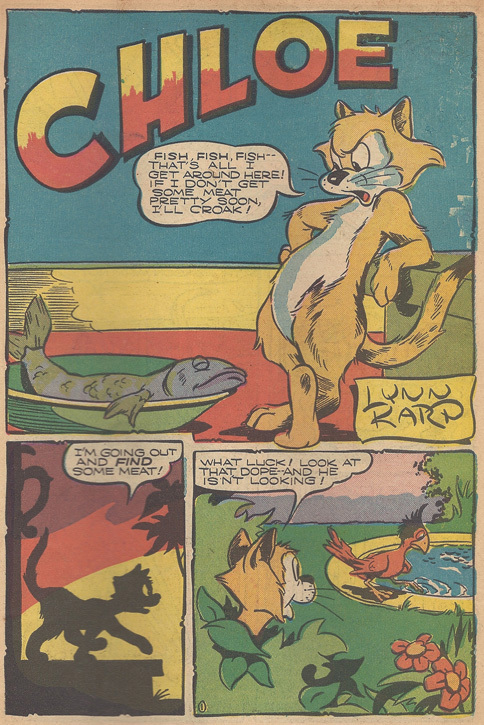 Of course, I've heard of Lynn Karp in the past and I've seen his name in the Disney drafts and that he's also famous in comics (although mind you, I'm not a fan of American or Disney comics—really only British comics). However, it's interesting when he says that he worked on a lot of Bambi when he was uncredited in the film. Although there were a lot of uncredited animators on that film that were assistant animators but Lynn wasn't an assistant then—already an animator. MB replies: It wasn't unusual for Disney animators not to receive screen credit as such. It depended on how much footage they animated, and whether the animation board thought the quality was high enough to merit screen credit. From Eric Noble: Fascinating interview. You can definitely say that he is an honest man, if a bit judgmental and prejudiced. However, his mind is sharp and focused here. It is very interesting to hear about the comic book industry at the time and the artists who worked at Western. What standards were they held to in terms of drawing and content of story? Did the publishers even care what they put out, as long as it got out to the newsstands? Also, his blase attitude toward his work seems a bit saddening to me. It just seems like he wasn't very interested in the work he did at Disney or for comics. Was he just a freelancer out for money, or was he just a frustrated fine artist? I'll leave that to you, as you know more about him than I do. It's really enjoyable to learn things about these people and their time in the business and the way the world ran back then. I have nothing in particular to add, just that I really appreciate your love of cartoons and the fact to you were motivated to do all this and to present it here on your website. My old friend and frequent collaborator Milt Gray has added some full animation of his character Viagri Ampleten to his comic-strip website about that character, and "pneumatic" is the word of the day. You can admire Viagri, and Milt's skill as an animator, when you click on this link. More information has turned up about Helen Aberson and Harold Pearl, the co-authors of what I've called "The Mysterious Dumbo Roll-A-Book," and I've seized the opportunity not just to incorporate that information in my piece with that title but also to rework it in other respects, and especially to make clearer what should have been clear in the first place (thanks, Jeremiah). The revised piece is more readable and interesting now, I think, and it's probably as complete a story of Dumbo's origins as you're likely to read until that distant date when Disney's "main files" disgorge contractual details that are now hidden. If, like me, you find Dumbo a source of endless pleasure, one of those rare animated features that seems richer every time you watch it, you will probably enjoy this piece, even if you've read the earlier versions. You can go to it by clicking on this link. In March 2010, as you almost certainly won't recall, I mentioned that my old friend John Benson had sent me a copy of André Martin's chart called "Family Tree of the Origin and Golden Age of the American Cartoon Film 1906-1941" that was published in connection with the 1967 World Retrospective of Animation Cinema at Montréal. I didn't even think about trying to scan that huge sheet of paper—three feet tall and four feet wide!—and post it here, but now Michael Sporn has gone and done exactly that: scanning it in sections that at least one visitor to his blog has reassembled into a replica of the original sheet. Simply amazing. The Family Tree scans are just the tip of the Spornberg, though. Recently (with the invaluable aid of Bill Peckmann) Michael has been putting up scans of the lovely illustrations from Bill Peet's children's books, as well as scans of Milt Kahl's wonderful animation of the llama for Saludos Amigos, animation that makes all the more poignant Kahl's complaints in the interview I've posted here about being restricted to "straight" characters in the later Disney features. Someone who restricted his animation-blog visits to Michael's "Splog" would still enjoy a very healthy diet of nourishing posts. I've noticed that when Cartoon Brew posts links to items like two I've just mentioned—my Kahl interview, Michael's Family Tree scans—the comments typically pour into Cartoon Brew at a greater rate than they do to the originating site. Substantive comments, too, like David Gerstein's and Charlie Judkins's skeptical remarks about the Family Tree, in addition to the usual ignorant braying. Is that good, bad, or neither? I don't know, but it does seem a little odd.